Time for one of my favorite reviews… Chocolate!!! I got some yummy goodies by Seattle Chocolates. They also sent some cute little tubes of coffee flour, cocoa nibs and cherry pulp which was awesome to see, as it is what makes up this delicious chocolate. Super Chocolate Dark Chocolate Truffle Bar by Seattle Chocolates. This one is “powered by coffee flour & cocoa nibs” , Non-GMO, vegan, gluten free, and Rainforest Alliance Certified. Upon opening, the aroma of chocolate is extremely strong, and quite delicious. I don’t think I’ve ever had such an overwhelming chocolate aroma by opening up a wrapper before! It is a dense chocolate, but softer on the inside (the “truffle” aspect, I am assuming). The taste is quite good- definitely a dark chocolate, but not super bitter. While it isn’t a melt in your mouth kind of chocolate (that’s the nature of dark chocolate), it is enjoyable, and I am not a huge dark chocolate fan. It has a semi-sweet sort of feel, kind of like when you pick the morsels out of cookie dough when making homemade chocolate chip cookies. It is sweet, but not overpoweringly so. I really enjoyed this! 1/2 bar is 190 calories, 15 grams of fat, 17 carbohydrates, 12 sugars and 2 grams of protein. 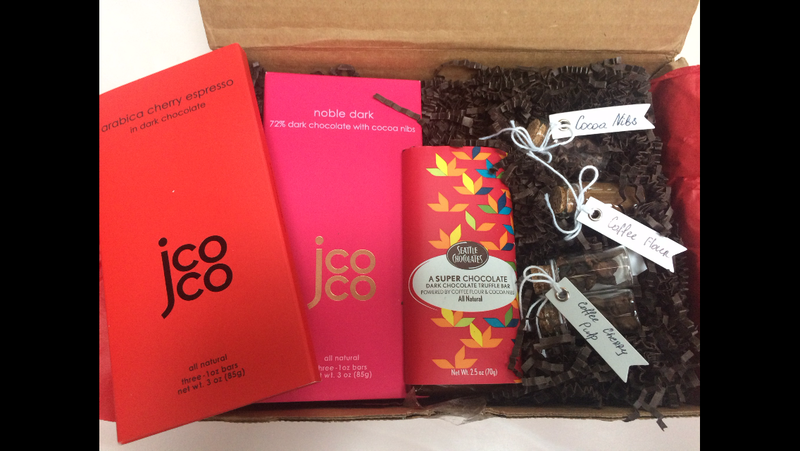 Next up, the Jcoco Chocolate (also by Seattle Chocolate Company). I was given two, the Noble Dark, which was 72% dark chocolate with cocoa nibs, and the Arabica Cherry Espresso in Dark Chocolate. I liked that when I opened each package, there were 3 mini bars inside, all individually wrapped, with fun pictures on each one. On the back it says “one bar= one serving to one in need” , where various donations are made, which you can read more about here. Both bars are all natural, non-GMO, vegan, and gluten free. 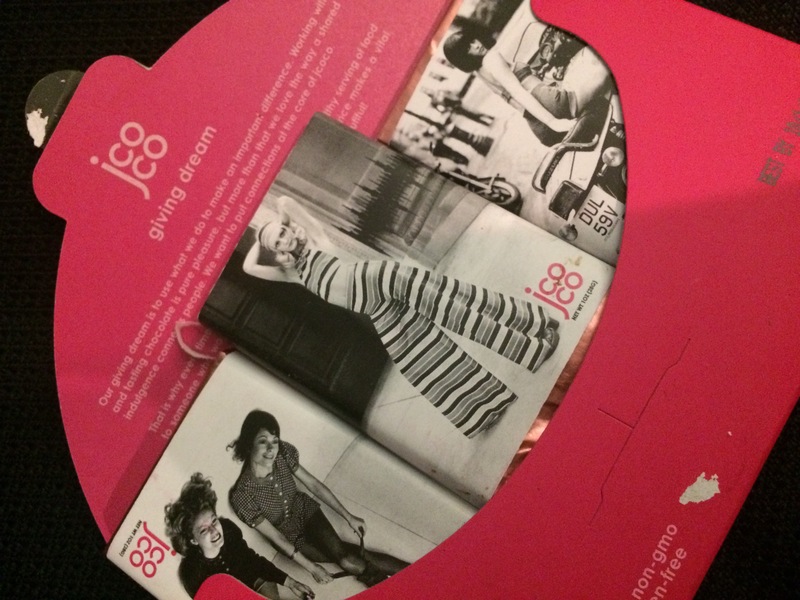 The box the chocolate comes in is on 100% recycled paper, and the products are Kosher. Talk about win-win-win for anyone with restricted needs trying to find some yummy chocolate, that ALSO is for a good cause! First up, the Noble Dark. Make no mistake, this was definitely a dark chocolate. A tad on the bitter side for me, but honestly, I still liked it. And let me repeat, I am NOT a dark chocolate fan. The cocoa nibs added a nice crunch and some texture to the chocolate. Again, not a melt in your mouth chocolate, but still good. Definitely a strong cocoa flavor, but tasted so fresh and pure, with mild sweetness. Next up, the Arabica Cherry Espresso in Dark Chocolate. This one definitely had a nice cherry undertone to it, which provided both sweetness and a nice flavor. This chocolate seemed to be smoother, and more “melty” in consistency. Not as bitter as the other 2, and a tad sweeter. I really liked this one. My favorite of the three. Overall, some pretty darn good chocolate. What’s better than satisfying a chocolate craving, while also giving back to those in need? Plus with dark chocolate, you get a little antioxidant boost that the news, etc. always raves about. Win-win! I would definitely give these a try, even if you are a milk chocolate fan like I am, because they are worth it, and please check them out if you like dark chocolate, you will not be disappointed! This is an unbiased review. I received these samples to try for free.